I've had a realisation. Or maybe just a clearer picture of something that is 'in the air' anyway, or I sort of knew anyway. I'll need to go round the houses a little to say what it is. HA said the bottom left shape doesn't point up so much. It seemed to point up quite a lot to me, and I told him so. But he was insistent, so I wrote it anyway. Yes. I am wondering if he means that the "support" part isn't as "high" as on the house. So fun to try to understand his thinking. 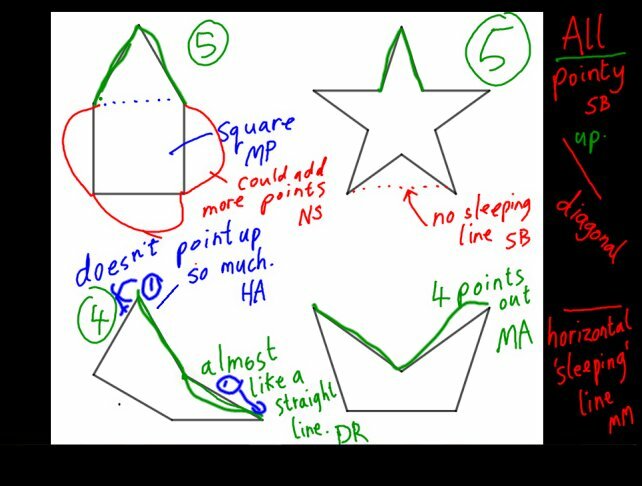 and explained that, if I understood rightly, the bottom right corner of that bottom left shape points downwards, and that kind of makes the whole shape less upwards-pointing. I thought it was interesting that underneath the apparently simple idea of pointing upwards, other interpretations or meanings could lie. It just took a bit of digging. A couple of posts back, I blogged about a pentomino Which One Doesn't Belong? and possible answers to it. Also, why do you say that the bottom right shape is convex? and it led to all sort of treasure. How would you be more precise about the intuitive idea of convexness or of concavity? How would you measure it? I had another idea. What if you looked at the 'compactness' of the shape, perhaps looking at what proportion of it is within a same-area circle? 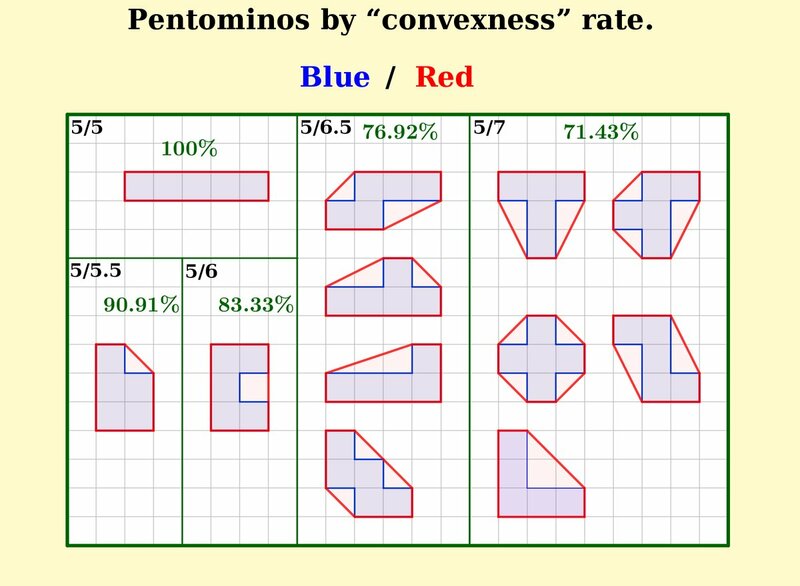 Justin then pointed us to an article, Convexity and Gerrymandering, that talks about all sorts of measures of shape compactness that reflect four essentially distinct characteristics of shape: elongation, indentation, separation, and puncturedness. That really struck me: essentially distinct ideas lurking under the surface of the intuitive sense of compactness or convexness! Ideas which could be measured in very different ways. 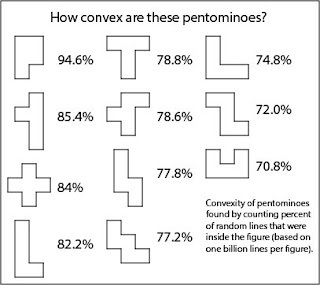 The way the authors of the article chose was to take pairs of random points within the shape and see what proportion of times lines between those pairs of points fall entirely within the shape. 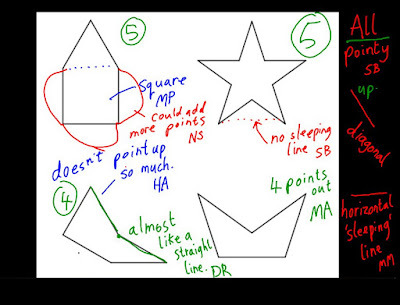 The really striking thing in all this to me is this: you have a vague intuitive sense of how convex a shape is. You start digging. 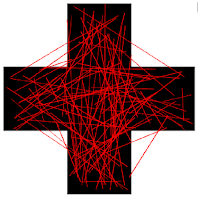 You see there are many different aspects of convexness that you could have in mind. How deep are the indents? What's their area? How stretched out is the shape anyway? And all sorts of other questions. 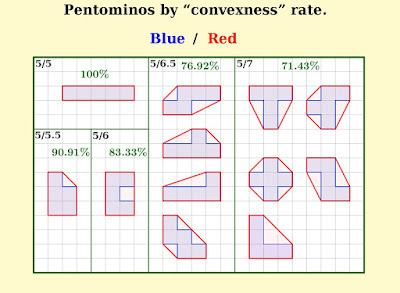 Look at Vincent's and Rod's convexness results: they're different, they order the pentominoes differently, because they're looking at different measures of what being convex is. Do you see how this links with what HA said? Students, even 5-year olds like HA, have intuitions about mathematics. They might not link to the ideas on our own map, or trajectory for our students. But that doesn't mean that they aren't describing something that could be mathematised in some precise way, measured numerically. We may just need to question more, see it from another perspective. 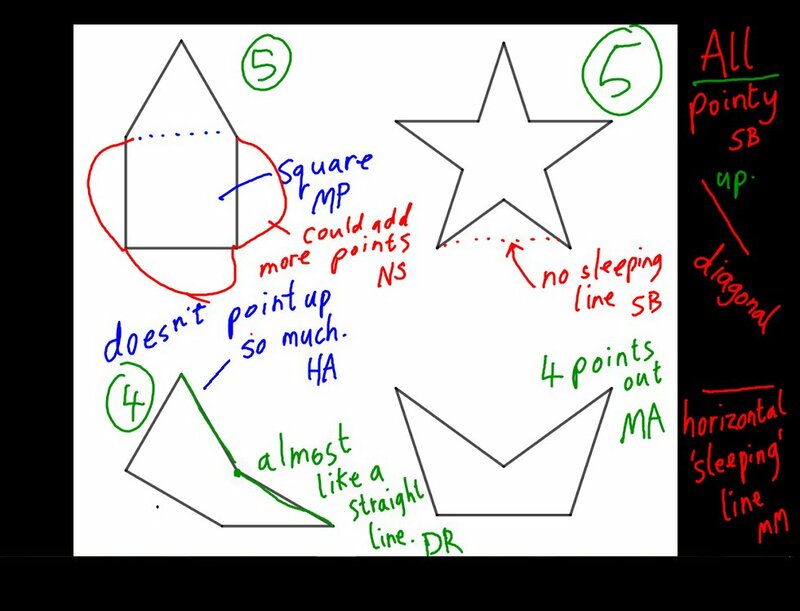 HA may have meant (and I'm still not sure) something that could be expressed as: if from the centre of each shape we take the mean direction of all the acute angles, the house points up, the star nowhere and the bottom right points up. Only the bottom left points up and off to the right. All students have mathematical ideas worth listening to and our job as teachers is to help students learn to develop and express these ideas clearly. Through our questions, we seek to understand student’s thinking. Simon, this blog is very interesting for me. It makes me think about nomination, a name for something coming into existence following the making of a distinction (and voiced?) 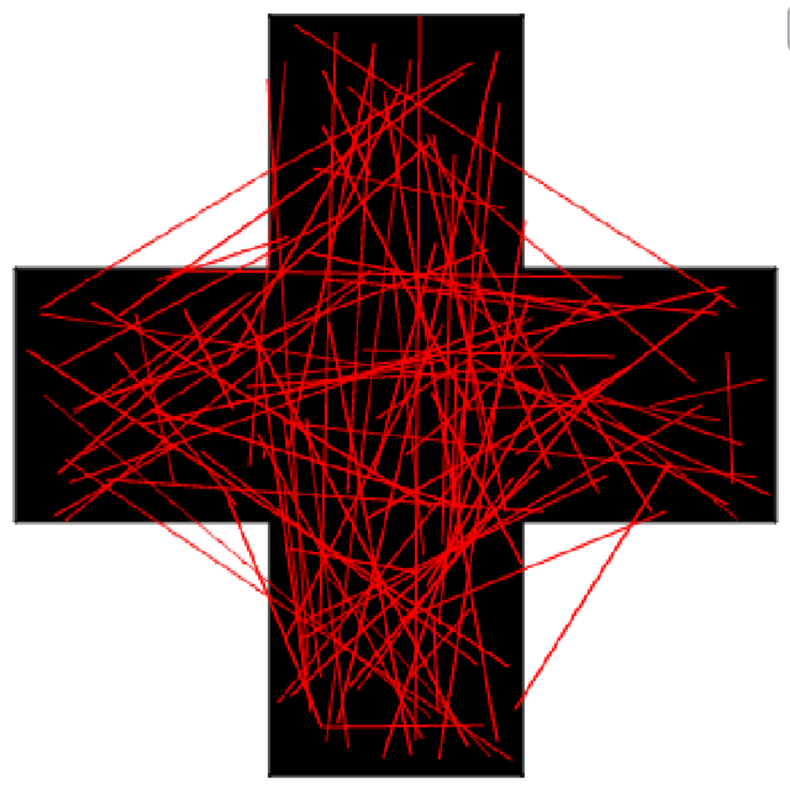 by someone, which in turn allows us to perceive things, and/or act, differently. In Gattegno's terms, this might be an 'awareness', something that we can (now) distinguish, and that leads to (a new) perception/action. 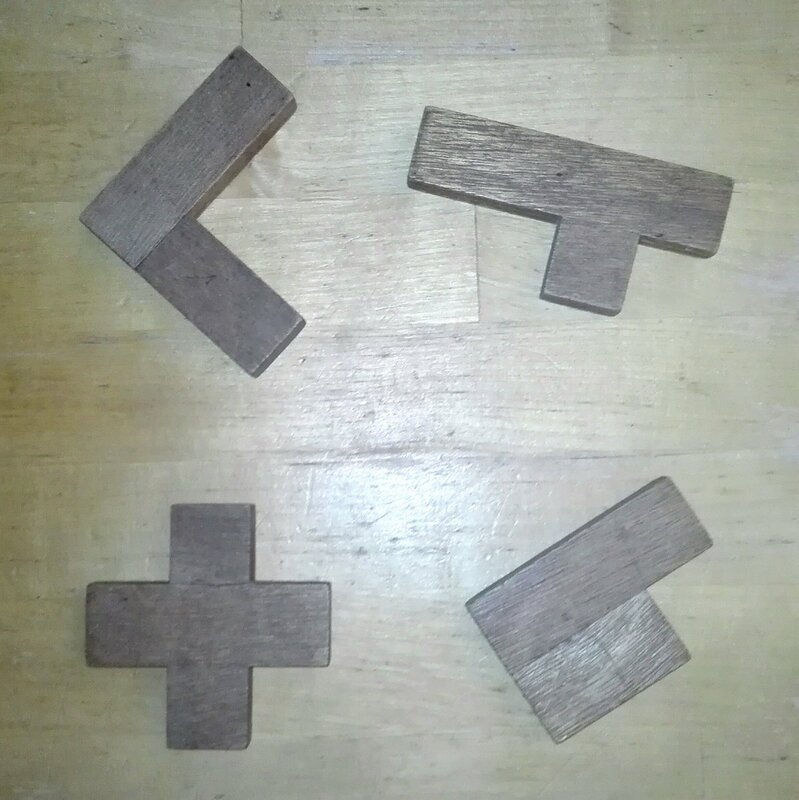 I haven't followed the links to other blogs yet, but am intrigued by the idea of different 'measures of shape compactness'. People talk about 'misconceptions', but often it seems more like there's a territory we haven't explored yet. We have hints and guesses about what might be there. We catch a glimpse and make a statement based on that. Often that glimpse is a true but minimal view of what is there, but we need to go and explore more, or think more, or talk more to start to distinguish the landscape. The links are mostly to parts of some fascinating twitter conversations that helped me to start to make more distinctions about compactness. And to think about how much of maths can be hidden at first. And that in a sense the maths is constructed by us to fit what we have noticed. The Work Inside of the Work - When you welcome unfinished learning, instead of feeling threatened by it, you can get pretty excited about how much of it there is to explore. Steve Wyborney: I'm on a Learning Mission.